Plus, breaking news: Aveda’s new Demi+ color line now gives you vibrant color in a fraction of the time. With this new formula, the process takes between 5 and 20 minutes, depending on shade and tone (shaving actual hours off your hair appointment). Read on for the hair color trends we can’t get enough of, more reasons we’re loving Demi+ and ways to keep that fresh-out-of-the-chair look, longer. Coined by Ian Michael Black, Aveda’s global artistic director for hair color, eclipting is a face-framing technique that uses highlights and shadows to complement your facial features—often making your face appear thinner. This “contouring of the hair” contrasts colors based on your undertones and features for a stark contrast with distinct changes. As an eclipse reframes the sun and the moon, this technique can reframe your look and light up your features. Bonus: This look loves extra shine. Aveda’s new Demi+ color line uses certified organic kukui essential oil, along with certified organic castor and jojoba oils, so your shine game has never been so strong. While Kylie Jenner has been posing on Instagram with teal hair for what feels like forever, fashion colors have recently made the leap from celebrity photo shoots and runways to real life (and we can’t get enough). From subtle shades of rose gold to bold ultra violet hues, these colors are here to standout and make a statement. 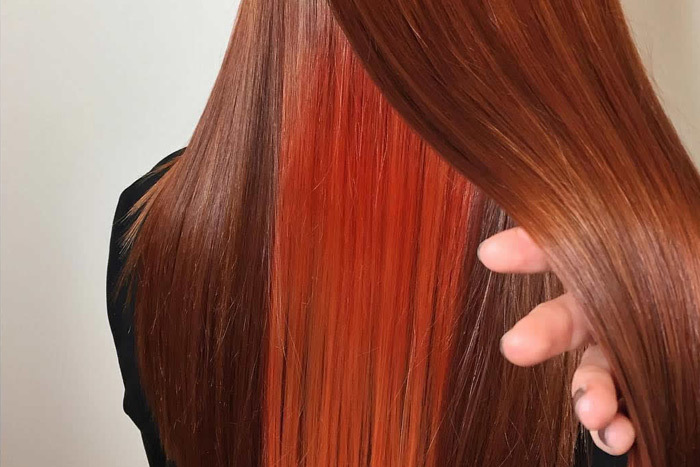 Enter Demi+ yet again: Aveda’s new color line is completely customizable, so you can choose your color’s hue and intensity to make it your own. Go for that bright blue you’ve been eyeing, or add subtle pops of pink just because. Its colors are as intense or low-key as you want, but its gel-like formula makes it fast, gliding right onto your hair for knockout results in 5-20 minutes. Whether you want to test-drive a color or show your playful side, we love a good peek-a-boo. These highlights are generally applied so that when your hair is down with your normal part, you don’t see them. One reason we’re fans: from updos and braids to killer curls and waves, this hot hair trend encourages cute (and creative) hairstyles to show off the color hidden in your hair. Aveda’s Demi+ adds not only the pop, but the low maintenance perk to this look. The new formula lasts up to 40 washes—so by the time you hit the grow-out phase, the color has faded enough to eliminate the “color line.” It’s the perfect way to play with color, without the commitment. Balayage may have been around for a while, but this look is still a crowd pleaser. From trendy celebs to the girl-next-door, everyone is doing it, and we *still* love everything about it. This hand-painted hair has a softer, more natural look. Another reason we love this look: it’s low maintenance. This technique isn’t applied to the roots, allowing hair to grow out flawlessly for less upkeep (and money). The highlights are hand-painted and are typically only a few shades lighter than your hair color, adding definite dimension without a drastic contrast. Did we mention it looks great with any style or cut? Another Demi+ plug: while most colors can be hard on your hair, Demi+ is so gentle and highly conditioning it can actually be considered a treatment for your hair. For grey coverage, consider adding a playful hue or go darker, for minimal maintenance. Keep your color looking fresh long after you’ve left the salon with Aveda’s Color Conserve (shampoo, conditioner, daily color protect and strengthening treatment). This four-product line works together to seal the cuticle so the color doesn’t escape, while strengthening your hair and adding extra shine. Considering a color update? Book your appointment at Indira Salon Spa. Go bold, stay subtle…but whatever you do, shine on.